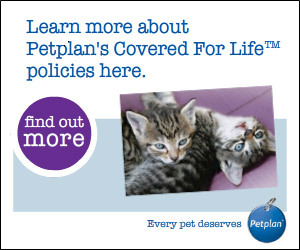 All Reiver Ragdoll kittens leave us vet checked, wormed, flea treated, micro chipped and with FOUR weeks top-of-the-range cover from Petplan Insurance. they offer and the cost. cover and you may decide to choose one of those. year would not be covered in the next. are a variety of common feline illness common to all cats for which there are no vaccinations. And then, of course, there are 'accidents'. in deciding which insurance cover to choose. Also, all have an 'excess' - an amount which you pay towards the cost of each claim. Again, check this out when deciding which insurer and level of cover to buy. Many vets offer a monthly 'pre-payment' scheme to cover the cost of future routine visits ie vaccinations, worming, teeth cleaning. While this is extremely useful, it is NOT the same as insurance cover. Again, if this is offered, do check with your vet what is included and whether you will need this in the first year of your cat's life with you.